DIY Airsoft M134 Minigun | OhGizmo! 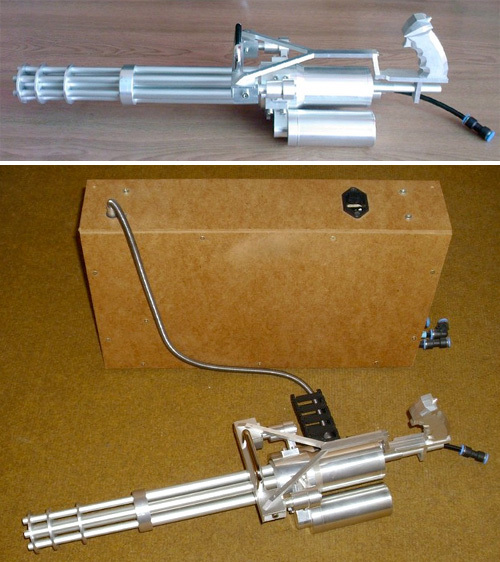 I can’t say I’m that big a fan of guns, but even I find it hard not to crack a smile when I see this miniature Airsoft M134 minigun literally shredding its way through a newspaper filled cardboard box at about 45 seconds into that video. If you’ve got the aluminum machining chops you can make your own thanks to a plethora of technical illustrations and tutorials on Kuba T1000’s website, and while I’m sure some of you will complain that it’s not accurate since the barrels don’t spin, I think you can cut the designer some slack since the gun is capable of firing anywhere between 300 to 6,000 pellets a minute, and is fed by an impressive custom made ammo box that can hold 16,000 rounds.